It’s a little sad that music like Lindsey Webster’s today gets pigeon-holed as smooth jazz, when just a few decades ago it would’ve simply been called some of the best Quiet Storm R&B/soul music around. Webster’s music is the kind set in someplace dark and smoky. The kind of music where expert, live musicians play under a silken, clarion voice caressing warm lyrics about love and relationships without irony or dismissal. The kind of music you want to relax into. There is nothing cynical or hard about Webster’s third return with Back to Your Heart. This sweetheart album places its blood beat front and center and makes one wish good soul music could simply be called what it is, if only so more of its fans can find it when looking. To be fair, Webster’s latest album does have a relationship with some of the classic albums of the smooth jazz genre such as George Duke’s Snapshot, Grover Washington, Jr’s Winelight, Randy Crawford’s Now It May Begin, Lalah Hathaway and Joe Sample’s The Song Lives On, and the like. But, it just as easily could sit comfortably next to The Stylistics Hurry Up This Way Again, Anita Baker’s The Songstress, Angela Winbush’s The Real Thing, Oleta Adams’ Evolution, Milira’s Back Again!! !, or Stephanie Mills’ Home. Ballad heavy albums flush with dark undertones, sung with flawless execution, and pregnant with moody, emotional moments. If there is a difference between Webster and these other signature performances, it’s the tight control Webster maintains throughout each composition without ever appearing to be controlled. Everything about her voice here lacks tension. Preferring the middle of her range, Webster’s instrument can take on a feathery timbre, gliding with ease and modulating effortlessly to convey soothing, cooing, and moaning with a kind of sultry elegance. Tonally, it’s strikingly beautiful to the ear. But, Webster also rarely loses herself in any kind of emotional, cathartic pathos; the rock bottom gutsiness is fleeting and largely saved for the closing track, “Fast and Slow.” You get the sense that she’s as enraptured by the caressing lullaby of her voice and this sultry music enveloping her as we are. 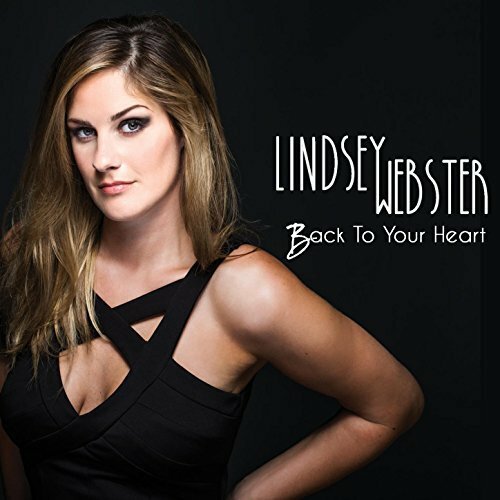 When Webster does allow herself the occasional sustained high note or the push into something raw and released, as she does on the title track, in harmony with herself on “I Know You Well,” or in the closing vamp out of “On Our Way,” you find yourself hungry for more of these moments of a more uninhibited Lindsey Webster. Three albums in we already know Webster has the goods; she has nothing to prove. Yet, one can sense her holding back to stay comfortably in the chanteuse lane even as her talent suggests greater heights, deeper passions, and a more powerful instrument to be mined; one that could awe us into silence, instead of pleased nods. This is a challenge for Webster to go there, because it’s clear that she can and her music will be better for it. The peak notes near the end of “Living A Lie” tell the tale. That’s not to say that Back To Your Heart isn’t an exquisite project. It’s the kind of loveliness that was a staple in the late ‘80s by artists like Sade, Brenda Russell, Patti Austin, and Anita Baker. With the exception of the polite party infused in the lightly funky “Ain’t It Funny,” these songs don’t disturb or interrupt. The compositions of Webster and her husband/musical partner, Keith Slattery, instead accompany and sweeten the air around it. In the current musical climate, their presence is a welcome enhancement of the atmosphere. A delicate song like “One At A Time,” Webster’s duet with saxophonist Kirk Whalum, is the kind of B-side fans adore, in the tradition of singer/sax duets like Grover Washington, Jr.’s “Just the Two of Us” with Bill Withers or “The Best Is Yet To Come” with Patti Labelle. On the track, Webster gives Whalum plenty of room to shine on her set, taking a backseat even as she softly sings with overdubs of herself, making sure you know she’s still present, even in grace. Her choice reflects an album rooted in grace and comfort, one with the ability to make listeners intimately feel both sensibilities. The writing by Webster and Slattery is sensitive, thoughtful, and classic in feel. The production by both and Mark Everton Gray (who also does an exceptional mixing job here as well) is top notch, if sometimes as restrained as their muse. Overall, this is easily among the best releases by Shanachie Records this year, and it’s nice to see the indie label break their formula by taking a chance on an independent artist who has had no major label support her past releases. With singles like the title cut, Webster may again find herself with a #1 Billboard chart position as she had with the divine “Fool Me Once” last year. It’s no less than what her talent deserves. Highly Recommended.